The following Setup Diagrams are meant to show in detail the interaction between the various studio components for some typical home studio setups. As mentioned on the home page, so many people start to get into this hobby only to become frustrated and overwhelmed with the process. But not you... because you are now here! 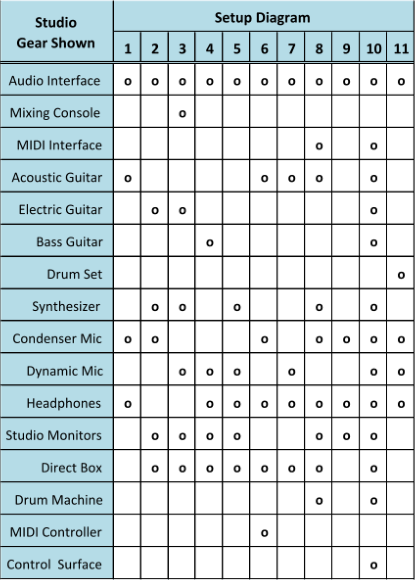 Even though your specific home studio setup will depend on the particular pieces of equipment you are trying to connect together, most setups will fall into one of the general categories listed below. Check out the following table to see the various configurations I've outlined. Each link will take you to a block diagram that will get you going down the right track. Still Need More? Complete Setup Diagrams to the Rescue! Later down the road you may choose to switch out one piece of gear for another or alter the setup to fit your unique needs, but these are a good place to start. Each description will give a listing of the equipment included, as well as the type and number of cables needed to connect everything together. But for those that want an exact recipe to follow, I have created a full set of Complete Setup Diagrams that detail every connection and list every component you will need. It really doesn't get much easier than that. So if you're looking to get started today I have you covered. Have a look around, there should be something here for almost every musician. If not, be sure to hit me up via The Facebook Page, and let me know what you'd like to see next.